4 Star Trailers are custom built with safety, durability and complete customer satisfaction in mind for every trailer made! All 4 Star Trailers have the patented "Concept II Design". In April of 1984, four men set out to fulfill their dream. The four men, from whom the 4-Star logo came, had a vision of a superior trailer carrying the 4-Star name. Holding a major portion of the trailer market, 4-Star Trailers now employs well over 200 people. Always continuing to improve and with the company-wide philosophy of maintaining superior engineering and quality workmanship, every new 4-Star has the same structural integrity as the first 4-Star. It is this belief that will keep 4-Star a force within the industry for years to come. All of our trailers are our patented Concept II Design. Concept II gives a smoother side while having fewer visible weld marks. Our deluxe model horse trailers are our most popular base models. All of our base models can be customized to suit your every need. Our base models consist of everything from Straight Loads, Center Loads, Slant Loads, Stock Combos, and Polo Trailers with the ability to build a trailer to haul from 2 horses to 15 horses. Our Stock Trailers can be built in box lengths from 10' to 44', heights from 4'6" to 9'6", and widths from 6' to 8'6". Options can allow you to build a single deck or double deck, add a variety of gates and other option, our Stock Trailers can be built to suit your exact needs. Using our lists of options, all of our trailers can be built to your specifications. Many 4 Star Trailers are equipped with Air Ride. Air Ride suspension will provide a superior ride to the traditional spring axles or industry standard torsion axles. While improving the ride for the trailer and tow vehicle, the largest advantage is for the animals. It will prevent soreness and stiffness in a long haul. Traditionally, a torsion axle is designed to ride best at close to its maximum load. An air ride will adjust the ride for the amount of weight loaded, for example, a four horse trailer equipped with air ride, will provide the same smooth ride loaded with one horse or four horses. 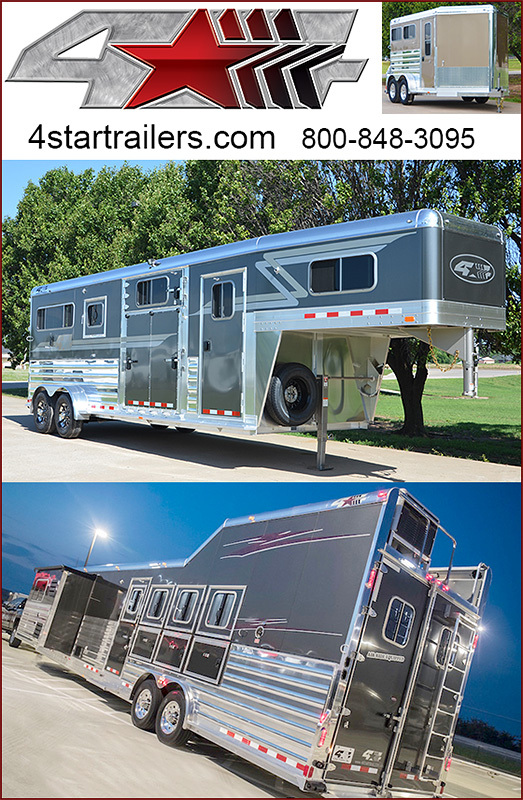 4 Star Trailers has several models in Gooseneck, Bumper Pull, Straight Loads, Center Loads, Slant Loads, Stock Combos, and Polo Trailers with the ability to build a trailer to haul from 2 horses to 15 horses! 4-Star looked into the future and had a VISION! Continuing the tradition of building the finest in custom trailers, 4-Star's Concept II™ VISION delivers an unprecedented blend of class and sophistication to create a unique, personal touch to your custom trailer. Our Goosenecks feature low position latches for drop down feed doors, drop down in rear load door, (2) load lights, and custom Vision tape job. Designed as a show stopper, the VISION is available in four styles: Polished Aluminum Extrusions, Anodized Aluminum Slats, Pre-painted Smooth Aluminum, and Stainless Steel; or a combination of the four for the Ultimate Show Trailer. Living Quarter Trailers available and all with AIR RIDE! Available in a 2 Horse Thoroughbred Bumper Pull or Gooseneck and a 4 Horse Center Load Gooseneck. Superior quality, attractive design, and the quality you expect with a "4 Star". 4 Star Polo Trailers are available in 24', 26', 28', and 32' models to suit the needs of horse owners who need to haul several horses in security and style! 14' Bumper Pull, 28' & 34' Gooseneck models to ensure that you have the right "4 Star" stock trailer for your horses! Where Can You Find A Dealer? Once you see a "4 Star"… you won't want to settle for less! 4-Star has dealers spread throughout the country. While we do not have a dealer in every state, we do have some of the best dealers in the industry. All of our dealers can price a custom trailer to suit your needs, while most of them have inventory that may fit what you desire. Our trailers can be shipped to your dealer, or even the possibility of having the trailer shipped to your door, we have customers all across the country. Please call 4-Star Trailers or email us today and we'll put you in touch with the dealer nearest you.